NEW! SUPER STUDY BOAT PLANS ... Delivered by DOWNLOAD to your computer within 12 hours of you placing your order. The study plans have lists of materials & equipment etc & these will be useful in costing out the complete boat. The plans have many large scale ( A0 size ) sheets of drawings and include detailed building instructions. If you order the STUDY plans then you will see for yourself the great detail that is included with these plans and building instructions. Each STUDY PLAN contains ALL the construction drawings for ALUMINUM CONSTRUCTION - with up to 30 sheets per plan! Lists of materials - Technical information - Numerous construction drawings are all included. 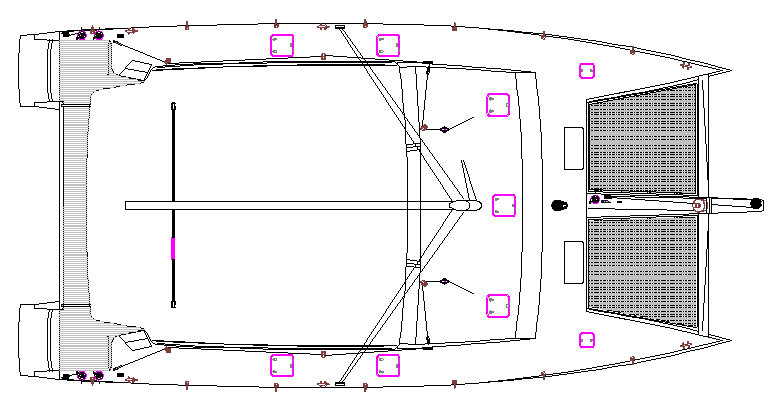 SPECIAL OFFER: BOAT PLANS & FULL SIZE FRAME PATTERNS .. Delivered by DOWNLOAD to your computer within 12 hours of you placing your order. 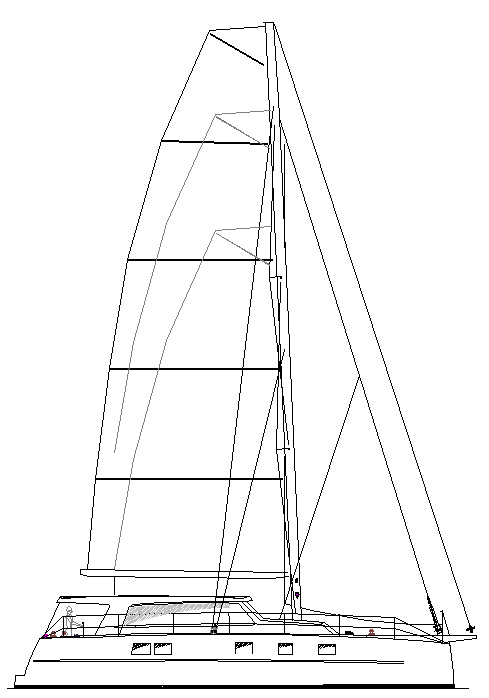 The plans have all the information you need to build your own aluminum catamaran. Each plan contains all the construction drawings & FULL SIZE PATTERNS for ALUMINUM construction. Plus bonus drawings covering electrical, plumbing and engineering, everything you need to build your boat. CATAMARANS 1300 & 1500 ALUMINUM CONSTRUCTION. ALUMINUM BOAT PLANS - These plans feature simple STEP by STEP CONSTRUCTION - these catamarans can be built by any person with aluminum welding skills ... NO previous boat building skills are needed ... all you need is to follow the plans and you will be able to build a beautiful aluminum catamaran for yourself and your family's happy days on the water. The CATAMARAN 1300 & 1500 are designed for family use and the accommodation was laid out with that in mind. The accommodation layouts of both these boats are similar in all respects ... the only difference is that the Cat 1500 offers more spacious arrangement while the Cat 1300 will be a little less expensive to build and equip. 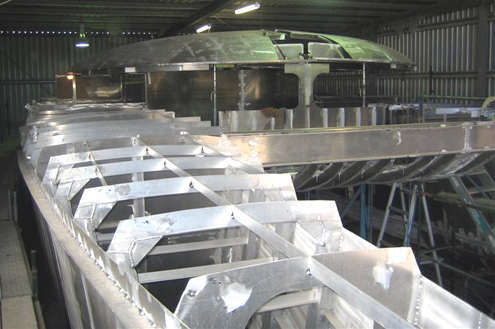 The aluminum building technique is well proven as Bruce Roberts has used similar techniques in building radius chine mono-hulled and catamaran sail boats since the early 1980'S. The Cutter rig shown here is an easily handled arrangement and ideal for a family cat that is capable of cruising wherever you want to want to cruise. The low aspect keels will give adequate windward performance and have the advantage of allowing these cats to be beached for anti-fouling or just to enjoy the beach with your family. 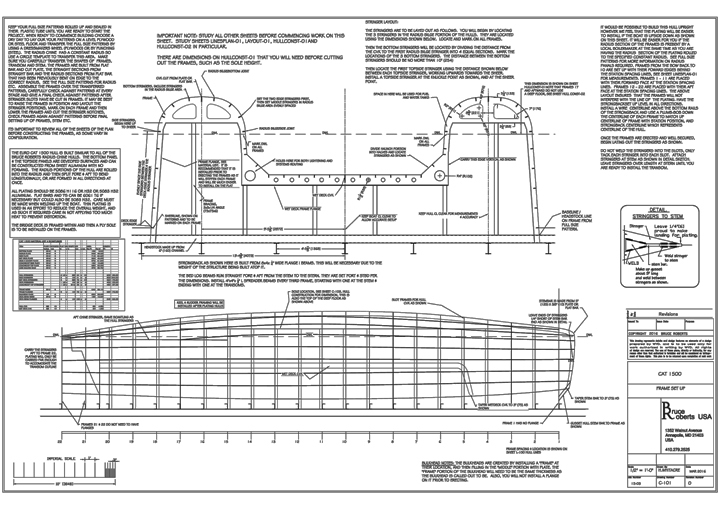 The study plans for the Cat 1300 & Cat 1500 cover many sheets of drawings and include all information on the aluminum construction methods, all engineering and rig plans together with STEP by STEP photos showing the aluminum construction methods as used in building Bruce Roberts Catamarans. The large deck area is ideal for easy handling and also for installing solar panels which can go a long way to providing the necessary electrical power for all those items that form part of a modern cruising catamaran. 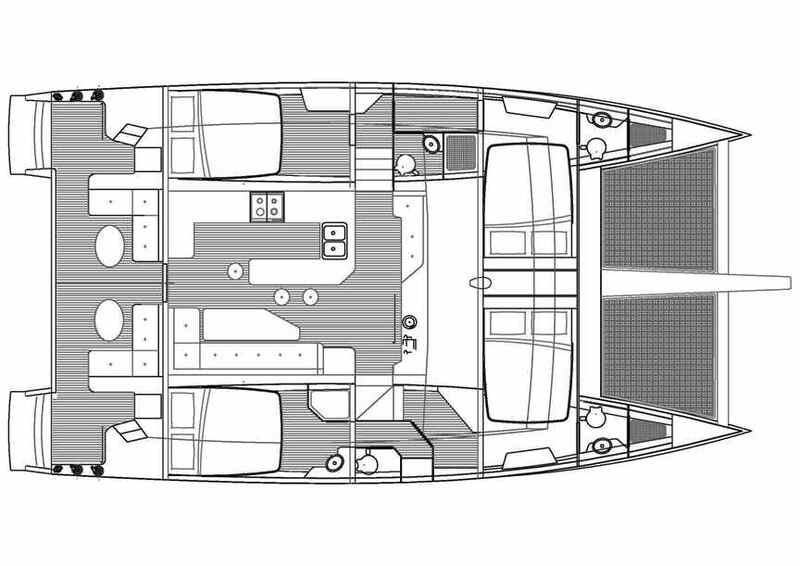 The accommodation layouts of both these boats are similar .. the only difference is that the Cat 1500 offers more spacious arrangement while the Cat 1300 will be a little less expensive to build and equip. POWER CAT 1300 & 1500 NOW AVAILABLE. The plans and full size patterns cover many large scale ( A0 size ) sheets of drawings and include detailed building instructions. If you order the STUDY plans then you will see for yourself the great detail that is included with these plans and building instructions. 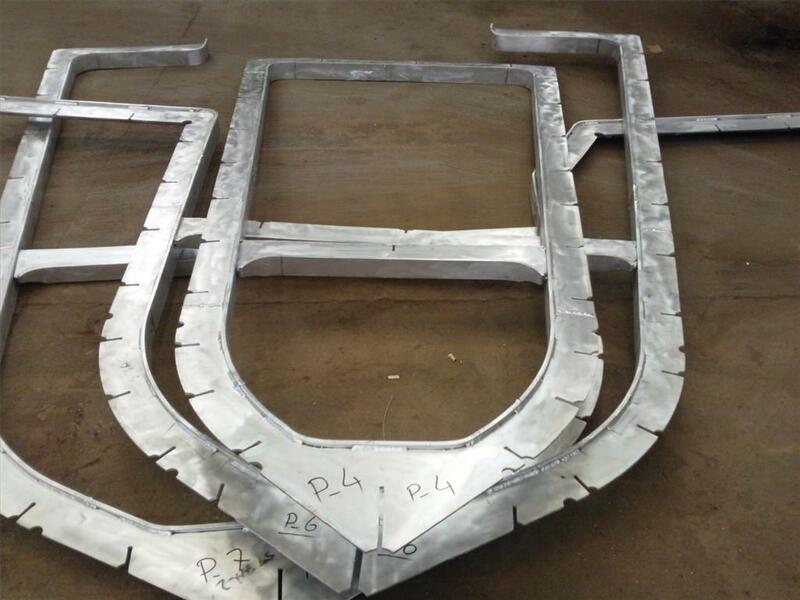 Here we see the frames assembled from flat bar stock and ready for installing on the strong-back as shown in the plans. All details such as the positioning of the stringers, radius of the radius chine sections etc, are clearly shown and on the plans by way of drawings and written building instructions that for part of the plans. Here we see the frames erected on a strong-back and the stock size aluminum flat bar stringers installed as shown. You will find the construction methods used to build these Catamarans simple and easy to follow ... the plans and building instructions follow a STEP BY STEP format that is ideal for the first time builder ... If you have aluminum welding skills then you can build this catamaran. 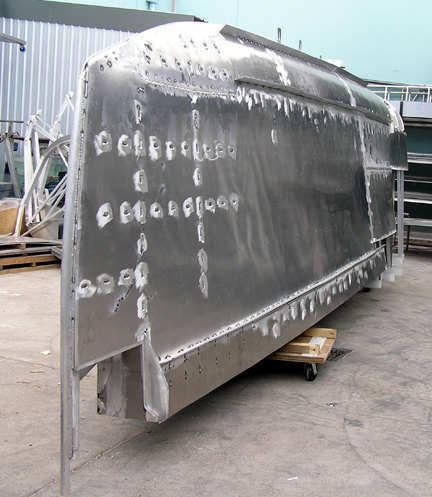 The hulls are fully developed in our computer programs so that the plating naturally takes the shape of the hull. 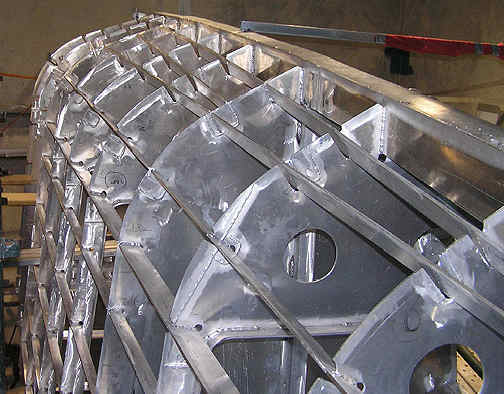 The Radius Chine plates can be formed by any Metal Shop that has plate rolling equipment ... as the radius chine plates are a constant radius these plates are easy to form and install on the hull framework as shown above right.